Ben & Jerry's Ice Cream BRRR-ito! We've known about the name "brrr-ito" but we had no clue what exactly was going to be the end product. When I went into Ben & Jerry's Scoop U and saw the promotion, I was beyond happy. 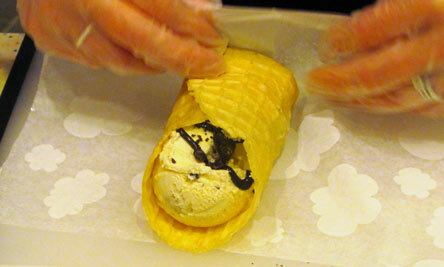 Ben & Jerry's has more or less created an ice cream burrito. 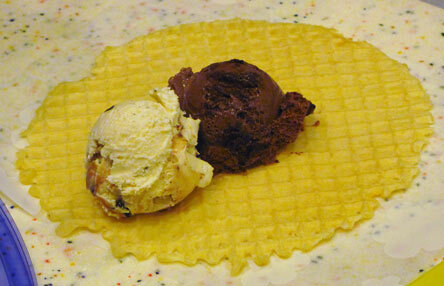 They start with a specially made waffle cone "tortilla" of sorts. After that, they take two scoops of whatever flavor you want (for the demonstration we were given brrr-itos with a scoop of chocolate chip cookie dough and a scoop of chocolate fudge brownie... so basically a deconstructed half baked brrr-ito). Then the ice cream gets topped with a drizzle of fudge and chocolate cookie chunks. 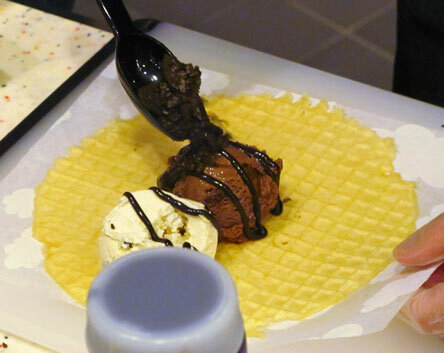 The waffle cone stays pliable making it able to be rolled into a ‎burrito. I'm not going to lie, I was a bit skeptical of the whole product once I saw it made and the reality kicked in that the waffle cone was going to be soft. 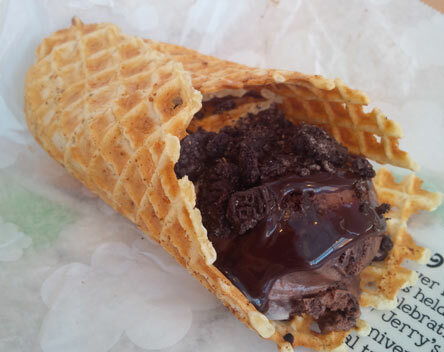 I'm not a huge fan of waffle cones normally plus I kept thinking about all the soggy choco tacos I've had in my life. Biting in, this novelty is actually pretty good. The main thing to talk about here in the waffle cone since the other ingredients are quite familiar. While soft, the waffle wrap isn't soggy. It has texture to it, almost akin to that of a traditional tortilla that has been toasted a bit. The flavor was also a lot more prevalent than I expected. I was expecting it to be just a vessel for the fillings but it adds some waffly goodness into each bite. There wasn't so much ice cream filling that you had to worry about getting it on you while eating. The chocolate cookies added the most to the textural component because they were fresh making for a crunchy element. The fudge sauce doesn't add much other than notes of chocolate that the cookies already do on their own. I get the idea to add sauce but I'm tempted to request caramel to try out a different flavor profile. The overal size of the brrr-ito is about the size of two klondike bars. It's not super big but it was pretty filling (for someone who was eating all day). I'm not normally a person to bite into ice cream but it wasn't as weird as I was expecting. I chalk this innovation up as a success for Ben & Jerry's. You might not have your mind blown but it's a novel idea and for the right price point, I see this being a big seller this year. I'm going to try to hit up my local Ben & Jerry's later today to see how the quality varies from getting it from Ben & Jerry's themselves to an independent franchise. 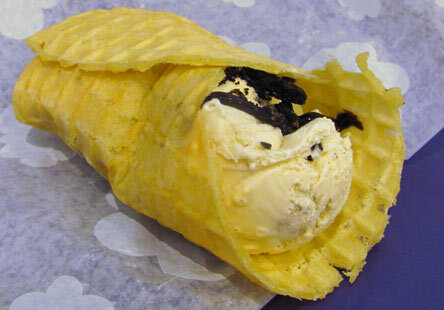 That and I have an idea to make my own custom brrr-ito that just needs to happen. Buy it myself? Will do! 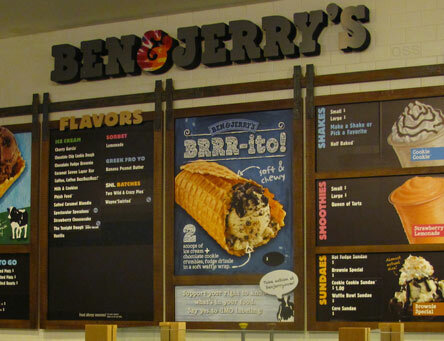 Update: I made it out to my local Ben & Jerry's to sample another BRRR-ito. Mine B&J's has actually been soft testing it since April 1st with the official release still being April 20th. My friend and I both ordered our own versions. She got one with the normal set up with a scoop of Milk & Cookies and Chocolate Peanut Buttery Swirl. Mine shared Milk & Cookies but it also had Chocolate Therapy making it an ultimate cookies & cream BRRR-ito. Yes, if I can I will make something as much cookies& cream as possible. And to be honest, it was delicious. The fudge sauce managed to stick out more here for some reason and it complimented the other two ice cream. I kind of wish that they'd make a cookies & cream cookie core flavor now. Especially with cookies & cream cookie butter being a thing, Ben & Jerry's needs to get on that for next year. There was only one problem this time around, the waffle wrap. Ours were hard and not so pliable. Since they make them in house, this is a problem that can occur and I'm kind of happy it did. Sure, it made it not as enjoyable as my first time around but it shows that errors can occur. It didn't hinder the flavor of the product but it was essentially like eating ice cream from a handheld waffle bowl since the chances of it breaking everywhere when biting into were very high. All and all, I think this is still worth a purchase at $5 if the waffle wrap is up to par. If not, I say go with another option and try again next time. Okay, that's all I have. Let me know what your experiences have been like in the comments or share what combination of flavors you'd want to try for your first BRRR-ito! Oh my ... nice surprise. AND it's a soft waffle wrap? My lord ... that thing looks like a fluffy, golden diner waffle. And wait, you've already had the pleasure of dabbling, Nick? Damn you! I love that the waffle is soft! Nick, do you know if Milk and Cookies is being discontinued by any chance? My local store no longer carries it. I was in another store a few towns over during a work break and they had it discounted with a sign that said discontinued. Maybe it's just the stores. Anon, Milk & Cookies isn't heading to the graveyard. It's probably not a big seller at those stores so they want to replace it with something else. You can always try their flavor locator if you're having problems finding it.